Selecting the right workstation for your team can make a world of difference in increasing their efficiency and your sales. It’s time to ditch uninspiring cubicles that prevent your team from working with one another. We understand that as a business owner there are a million things you need to do to make sure your business runs smoothly. Having a modern office might not be at the top of your list right now but trust us when we say making sure your staff have a well organised and streamlined workspace needs to be a top priority. Selecting the right workstation for your team can make a world of difference in increasing their efficiency and your sales. Not only do your employees need a functional space, but they also need one that is stimulating. Office screening can be a unique way to separate individual workstations while allowing airflow and the flow of ideas. It can be hard to please everyone, but sometimes all you need is a collaborative office layout with pops of colour to inject some much-needed life into your employees. The most rewarding thing is watching them thrive and generate innovative ideas and solutions. Our extensive range of Urban Workstations, Civic Workstations and Cosmo Workstations will help you create a company culture of life and energy. The arrangement and placement of office furniture are vital to support the kind of work you do. It’s all about you. Your own personal preference and working style. Want a more compact and streamlined workspace for a single monitor? Then a straight desk may be the perfect choice for you. Need a second monitor and more desk space to spread out essential documents? Then a corner workstation may be your ideal fit. Need to make important phone calls and handle confidential cases? A private office or workstation with wrap around screening can minimise distractions and noise. Does your new job involve working with a highly collaborative and dynamic team? 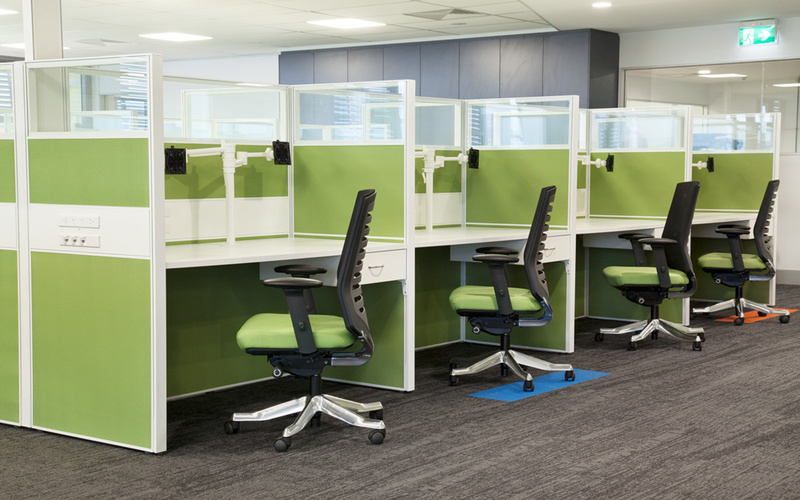 A 4 person workstation creates a shared work area but ensures everyone has their own space. Need office furniture that will be able to last for years come? The majority of our furniture is backed by an impressive 7-year warranty because we use high-quality materials instead of cheap alternatives. Whether you’re looking to improve your current office layout or completely upgrade your entire business, our massive range of single person, 2 person, 4 person, 6 person or custom office workstations work together simultaneously to build the perfect office space. We manufacture our products on the coast. We specifically tailor 2D & 3D floor plans to your exact space requirements. We are experts at furniture and colour selection. We specialise in coordinating office fit-outs. We’ll work with you to find the right combination of shared or private workstations to ensure all your employees are happy and productive. More importantly, we want your office to look good, and we want you to feel good in your office. We guarantee your brand new modern and sophisticated office workstations will WOW your clients and your employees. When you’re ready to upgrade your business one of our expert Sales Consultants is prepared to assist you from any of our locations across Australia including Brisbane, Perth, Sunshine Coast, Sydney, Melbourne, Gold Coast and many more.